If you didn’t read the first article about Rainbow Ridge, you can see it here. In the final article about the cutest minding town in the west, we look back to its roots. 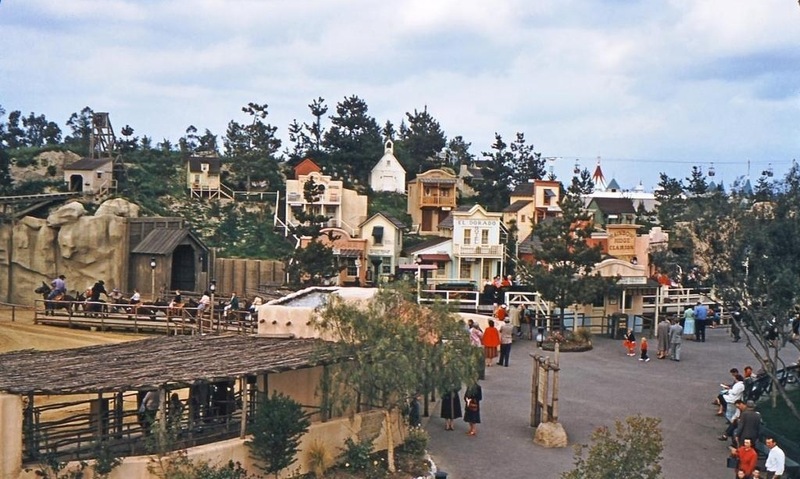 The Rainbow Caverns Mine Train opened on July 2, 1956. The attraction shared space with the Pack Mules, Stagecoach, and the Conestoga Wagon attractions. To help hide most of the attraction, they built a large hill behind the mine train boarding area. This was very similar to the “berm” Walt built around the train tracks. This helps hide the outside world from Disneyland. The same concept is used here. They built many buildings up on the hill side and called the town Rainbow Ridge. There have been three generations of Rainbow Ridge. The first opened in 1956 with the four attractions. The largest difference in the first two generations is the boarding area for the pack mules . In the first generation, there was a large hillside that had a faux bridge that lead to a mine shaft. The stagecoaches and the mules traveled around this hillside. In 1960 this area was rebuilt. The large Rainbow Ridge Hotel was relocated to this side. They also added the Opera House next the the Mine Train’s entry tunnel. 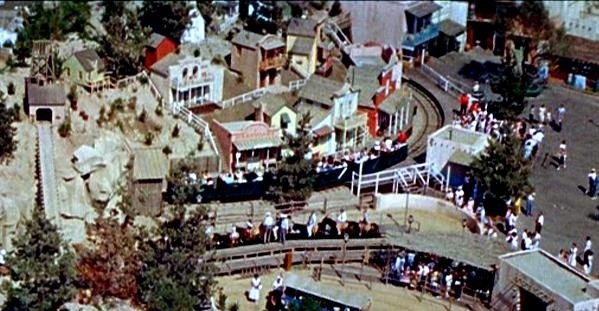 Many buildings were added to the far west side. Sadly they closed the Stagecoach and Wagons in this remodel. They had many trees on the hills here and they grew a lot over time. This makes it really hard to find out information about the building names. I have made some layouts of the two original Rainbow Ridge mining towns. Thanks for reading and share with your friends. I hope you like the Kolby Konnection Facebook page because we’ll have live updates at Knott’s Berry Farm on Saturday morning as they open their new attractions. You can email me for questions and suggestions for articles you would like to see at kolbykonnection@gmail.com. Please leave me a comment if you miss the old Rainbow Ridge and how do you feel about the relocation they went through. 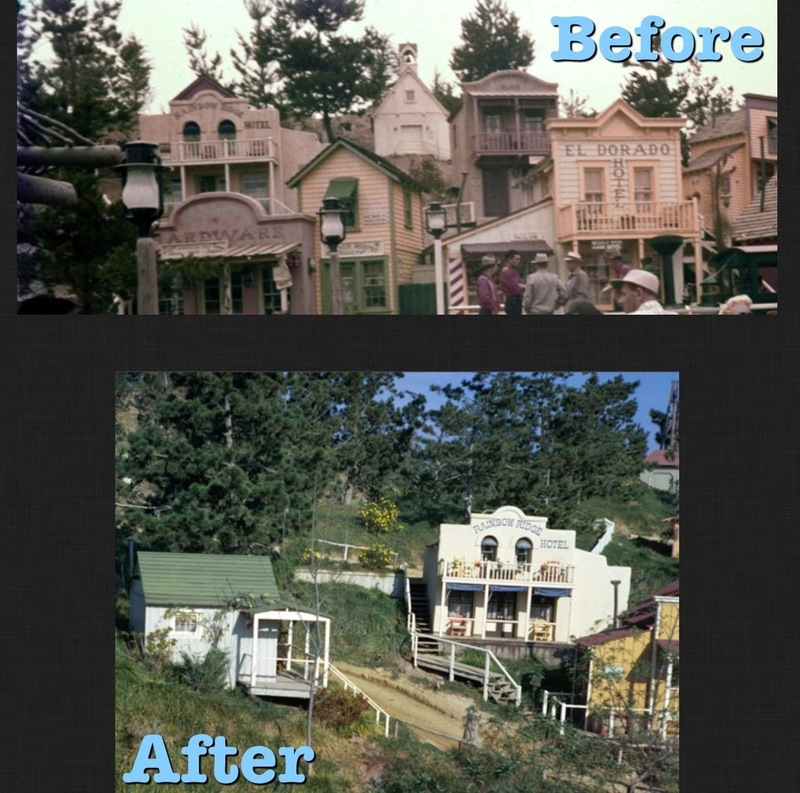 Kolby, I have been researching this attraction for about 2 years in preparation to model the entire attraction and you have the most comprehensive information on the before/after 1960 changes to Rainbow Ridge that I have yet seen. Great work! Thank you!!! I’m glad I was able to help! Please share your model with me when your done!!! !